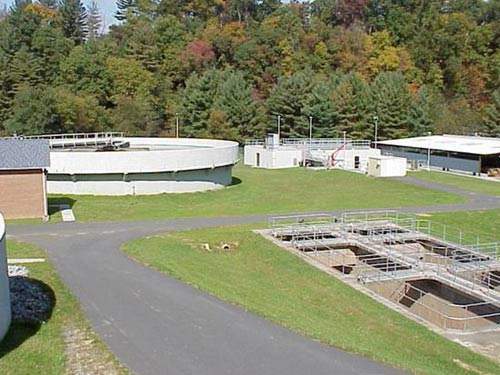 Formerly known as the Town of Boone facility, the Jimmy Smith Wastewater Treatment Plant won the 1999 Engineering Excellence Grand Award from the American Council of Engineering Companies of North Carolina. An aerial view of the plant. 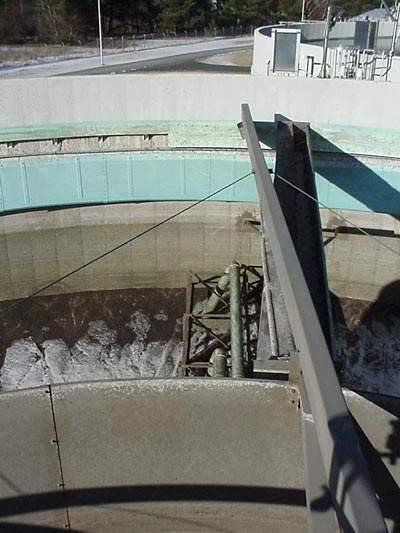 The wastewater treatment regime at the plant involves oxidation ditches, circular clarifiers, deep-bed tertiary sand filtration and ultra-violet disinfection. Sludge scraping on the 28m clarifiers. The plant has two of these, which receive the effluent from the new oxidation ditches. 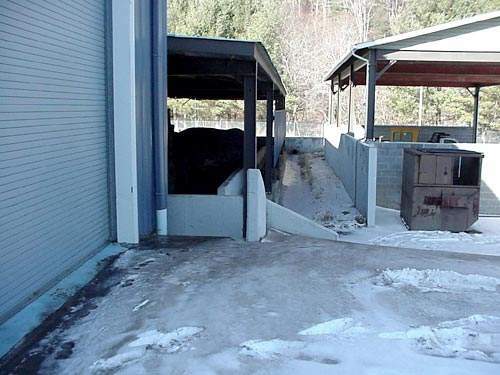 Boone's sludge disposal has been revolutionized. A combination of dewatering by polymer and belt press methods, together with the new Atlas Stord Class A thermal drier (the first such municipal unit in the state) yields a 90% dry biosolid ideal for fertilizer use. 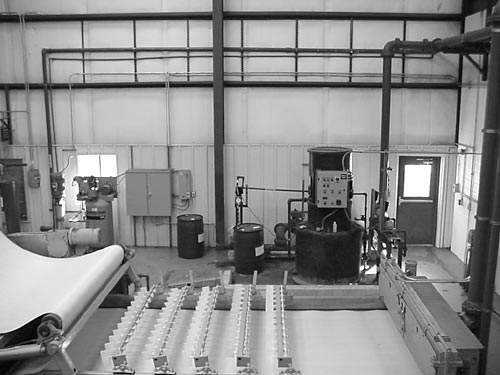 The belt press after installation; the sludge stream passes through the belt press at 16% solids. Finished biosolids storage; over half of the material produced has been distributed to the public. Class A sludge is approved for land use 3m to 9m away from a stream. 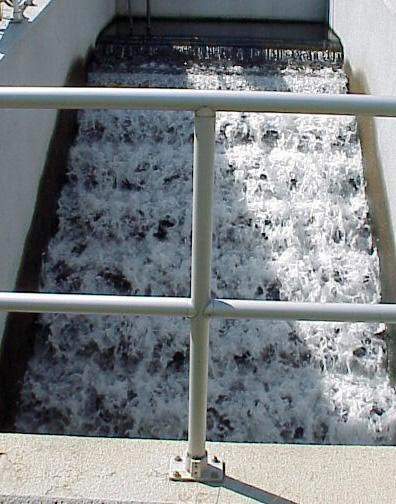 Cascade aeration; the treated effluent is discharged into the South Fork of New River. The plant upgrade was driven by increased environmental standards when this waterway was designated an Outstanding Resource. Although the plant has a capacity of 18,250m&#179;/day, it is currently running at approximately half capacity. A 2003 Watauga County report concluded that the Boone system offered the greatest potential for water and sewer partnerships. 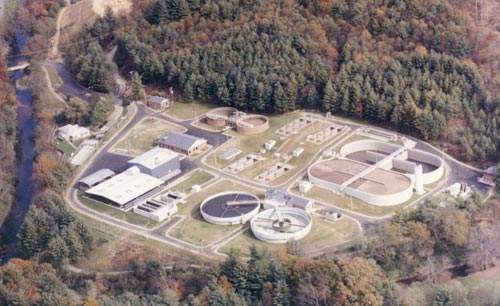 April 1998 brought the completion of the four-year project to rehabilitate, upgrade and expand the ageing wastewater treatment plant at Boone, North Carolina. A Class III facility, it was built in 1966 to treat 12,000m³/day and discharge a 30/30 effluent. The more stringent environmental regulation standards imposed when the state designated the receiving waters an Outstanding Resource made its overhaul inevitable. In addition, the growth of both tourism and the Appalachian State University had also stretched the available treatment capacity. The Town of Boone Authorities awarded the contract for the necessary work to Thamer Construction. Hobbs, Upchurch & Associates, who had been involved in an ongoing review of the facility since 1992, fast-tracked the new design in three months to meet a State Revolving Fund (SRF) deadline. The first treatment system of its kind in the state, it won them the 1999 Engineering Excellence Grand Award from the American Council of Engineering Companies of North Carolina. Several options had been considered for the plant’s expansion. Land application, the use of constructed wetlands, extended aeration activated sludge, trickling filtration followed by suspended growth and a variety of measures designed to enhance optimal operation of the existing facilities were investigated. As a result, it was decided to replace the old secondary treatment system, install a new tertiary treatment stage and change the disinfection regime. Although much of the old plant was demolished, the anaerobic digesters were retained, the existing headworks remodelled, new influent pumps installed and the onsite laboratory upgraded. The initial budgeted cost was nearly $14 million, of which around $800,000 was allocated to design and inspection fees. In the end, careful project management meant the work was completed six months ahead of schedule and $150,000 under budget. $12.8 million came from low-interest SRF with the town providing the balance. Originally known simply as the Town of Boone facility, it was renamed the Jimmy Smith Wastewater Treatment Plant in 2001. The inflow first passes through two automatic bar screens. Submersible influent pumps then pump the wastewater to the plant high point to establish the head of pressure to drive the flow through the treatment process. After passing through grit and grease removal, the flow is directed into one of the two 9,000m³ oxidation ditches, which were installed to replace the plant’s previous trickling filter and brush aeration system. The ditches are equipped with 3,800 fine-bubble diffusers, which provide efficient oxygen transfer for optimum biological treatment and nitrogen / ammonia stripping. Three aeration blowers have been fitted. The current influent loading only requires one of these to be used, allowing both back-up provision and scope for future increased capacity, should it become necessary. Effluent from the oxidation ditches flows to two 28m circular clarifiers, before entering four deep-bed tertiary sand filters for further solids removal. Ultra-violet disinfection, using a horizontal array of 32 self-cleaning, medium-pressure 2.8kW lamps is the final treatment process before the water is discharged into the South Fork of the New River. 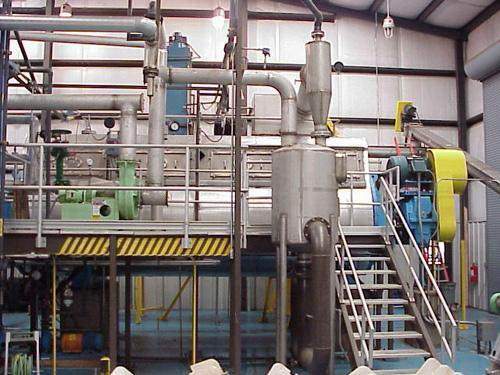 This has enabled the plant to meet the microbiological standards imposed, routinely achieving four to seven colony forming units (CFUs) per day against a state allowable maximum of 200 CFUs/day, while stopping the previous use of traditional agents such as chlorine and sulphur dioxide. 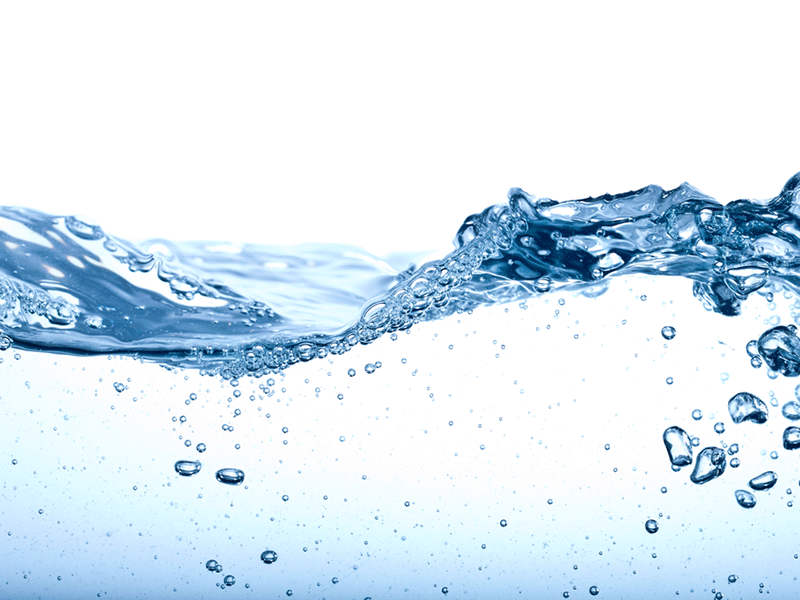 In turn, this has reduced the potential for the production of disinfection by-products (DPBs) in the receiving water. Polymer dewatering agents are added to the post digestion solids which then pass through a 2m belt press, reducing their water content from around 97.5% on arrival to between 82% and 86%. This sludge is then further treated in the plant’s new Atlas Stord Class A thermal drier. The is the first such unit to be built in North Carolina for municipal use; Stord dryers are more commonly found in rendering plants. Historically, Boone had a problem with sludge, principally as a result of the volume being produced and the town’s location. In the heart of the Blue Ridge Mountains, at an average altitude of 1,000m above sea level, the area’s large number of streams, lack of suitable flat sites and climate made land-spreading impractical. As a result, sludge had to be hauled away by road for disposal. However, the plant’s novel thermal treatment approach (which came at a complete package cost of around $2 million) has revolutionised the whole sludge issue. The Stord unit delivers a product with a water content typically little more than 10% – a dry, workable material with great potential as a soil improver. Under the relevant local legislation, Class A sludge is approved for land use 3m to 9m away from a stream and the use of the material has been promoted for its beneficial fertiliser value. In recent years, over half of the class A biosolids produced has been distributed to the public, the recipients also receiving appropriate information on its proper handling and use. Boone is the county seat of Watauga County in north western North Carolina. While the town’s population of 14,700 is growing at an annual rate of around 4%, the county has a growth rate in excess of 15% a year. The county has no public water infrastructure; all of the four towns in Watauga County own and operate their own municipal water and sewer systems. With a growing population and increasing demand for affordable housing, which relies on easy and economic connection to water services, the County Authorities have long recognised the importance of the issue to the future economic development of the region. 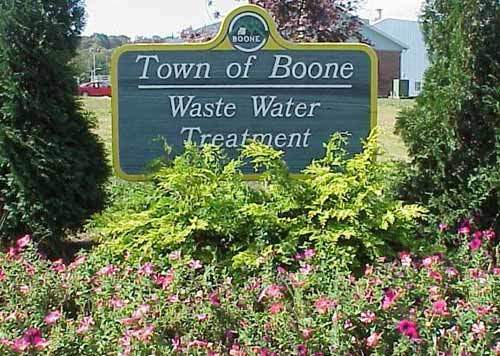 Watauga County Water and Sewer Committee finished their year-long study in March 2003 into the possibility of establishing water and sewer partnerships, concluding that the Boone system offered the greatest potential. Although the WWTP has a capacity of 18,250m³/day, it is running at approx. half capacity, which could open up possibilities for additional flows to be treated at the plant. In March 2004, Boone Councillors began the consideration of a request from the neighbouring town of Blowing Rock for an interconnection of their respective systems, which would involve construction of a line along Highway 321. While the County authorities have not, thus far, been involved with these discussions, they have expressed their interest in participating in the negotiations and planning for any utility extensions along the Highway 321 corridor. It remains to be seen whether this will ultimately lead to the spare capacity at the Jimmy Smith WWTP being utilised as part of the wider cooperative partnership suggested by Watauga Committee study. The plant is owned by the Town of Boone and operated by the Department of Public Utilities. Majority funding came from North Carolina State loans. Hobbs Upchurch & Associates were project engineers and were responsible for the 201 Facilities Plan update and design. Thamer Construction was the lead contractor, with a smaller contract going to National Electric. Atlas Stord supplied the thermal drier and sludge equipment. Sanitaire diffusers were used in the oxidation ditches.